The Spanish word Murciélago is pronounced murθiˈelaɣo, the θ being shorthand for a voiceless dental fricative. A voiceless dental fricative is the noise you make from inside your $300k Lambo moments after being rear ended by a pickup, but just before the flames start to lick your eye like a Japanese school girl. The Lamborghini Murciélago was the first new model released by Lamborghini after its acquisition by parent company and global super power Volkswagen. The name Murciélago was, in the Lambo tradition, named after a famous Spanish fighting bull and as such should be pronounced not like an Italian name, but like the Spanish word for bat in Castilian Spanish, complete with voiceless dental fricative. Even used, the Murciélago is an expensive car that will never be affordable to the common man...unless it needs some work. 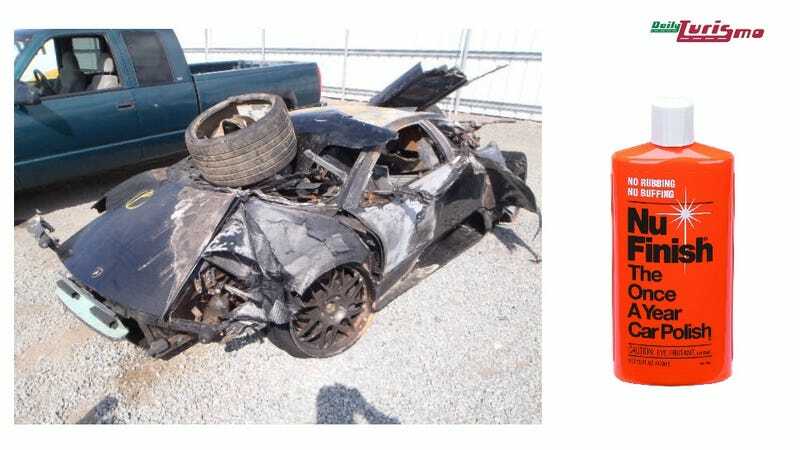 Find this 2003 Lamborghini Murciélago that needs a good buffing and oil change for sale in Baton Rouge, CA for $11,600 or offer via ebay. This fighting bull has been run down, stabbed 24 times with a sword, lit on fire and now sits in a salvage yard, awaiting its fate. This is what you get when they ask you how you'd like your supercar and you answer: "Cajun." The Murciélago was once powered by a 6.2 liter V12 putting out 572 horsepower into a 6 speed manual gearbox that puts power into all 4 wheels. What remains of the original 6.2 liter alloy piece of art is a great question as the seller mentions that "The engine and transmission are fine. However, the heads will have to be removed, and checked since aluminum particles from the plenums have fallen in the intake valve ports." What is clear is that the wiring harnesses have become shoestring fries and you may need to create the world's first Megasquirtciélago. If the engine/trans are indeed intact and don't need $50k worth of Lambo dealer service, this could be an excellent source for a nice drivetrain for a project. Or it could be a total pile of burnt up crap that isn't worth 50 cents.